Hello, Chupa again with two more cards and an inspiration for Mother's Day and Father's Day alike! First up, a one-layer with a fussy cut floral accent, using the beautiful Spring Blooms and Strictly Sentiments 4. 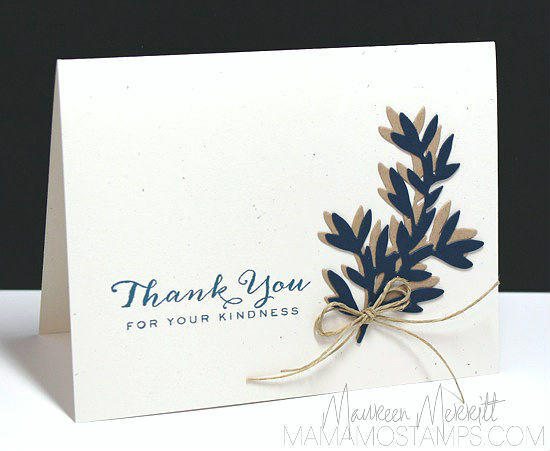 I stamped the foliage on Kraft Cardstock, first with Lake House Dye Ink and then over-stamped with White Pigment Ink, while stamping the second time a little bit offset to give the images depth. 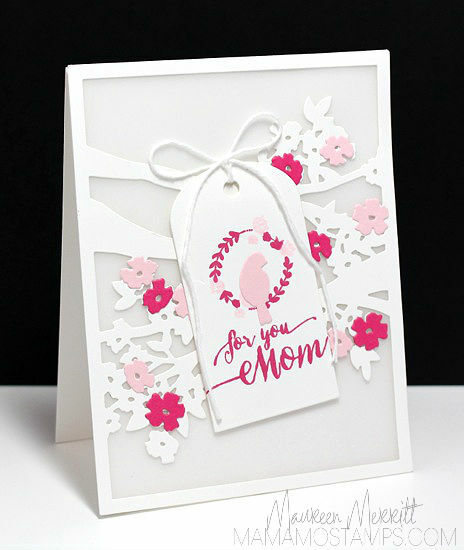 The petals of the flowers were "sugared" with a coating of glitter glue, die cut with the Spring Blooms Die and mounted with dimensionals with the petals curled up just slightly. The sentiment was simply stamped in black, the fancy font is a stand-out and is all the card needs to take it to the next level. Next up, is a rad card for a dad! It started by stamping some Ink Splats on Oatmeal Cardstock panel, with various Dye Inks: Appletini, Nautical Navy, Silver Lining and Wild Mango. 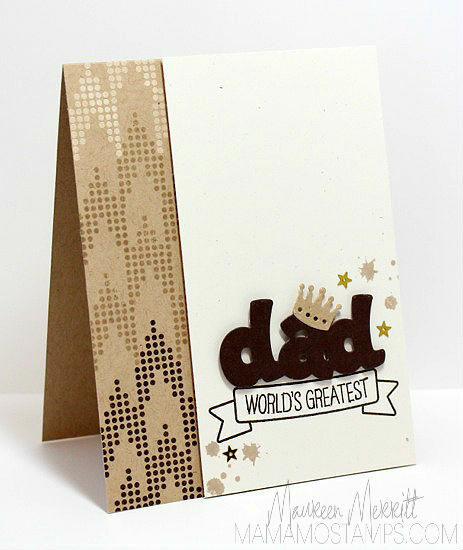 Then I die cut the shadow 'dad' shape with the Epic Dad Die and stamped the sentiment from Epic Dad over the splats. I mounted the panel on the card front and over some freely arranged patterned papers, and fitted the die cut sentiment back in, only using a flat adhesive instead of foam tape and thus creating dimension. Then I cut the crown with the Epic Dad Die from glitter cardstock, stamped the 'you're swag' sentiment from Epic Dad on a scrap piece of cardstock, cut out and mounted on the panel. It was great to 'see' you again, tune up tomorrow for some more inky fun! Hi there, Iwona (Chupa) here with more April / May Release goodness! Today I have two wedding cards to share with you. The new foliage dies are gorgeous and versatile. They would suit a variety of occasions and I'm covering one of them today! The Birds & Branches Frame Die is especially suited for love-themed cards, thanks to the "love birds" that we can perch on one of the branches. I covered mine in Silver Lining Dye Ink and applied a generous layer of chunky glitter glue to each. Once dry, the colour and texture gave a brushed pewter look - quite lovely! The frame was cut in a decorative textured cardstock to gave it a more realistic, natural look. I mounted it over a layer of patterned paper and stamped the sentiment from Fresh Cut Wreaths, in Silver Lining Dye Ink. To add a little depth, I watercoloured the flowers the traditional way, and applied Glossy Accents over them. Love the smooth look and feel, and the extra interest it adds to the scene. I went for an organic look on this card as well. Yet again, making woodgrain texture a feature (more prominent yet) and using foliage die cuts. This time, I cut both of the large frame dies - Foliage Frame and Birds & Branches Frame dies and paired them together. I ran the single branch from Foliage Frame Die through my die cutting machine five times (using a piece of patterned paper), and removed the parts of the foliage facing inwards to create a denser look for my wreath. Once I had the pieces arranged in a wreath shape on the panel, I filled in the gaps with the previously removed parts. A few flowers from Birds & Branches Frame Die, cut from white cardstock, scattered around and topped with tiny pearls, complete the look. The sentiment is courtesy of the Written On Ribbon stamp set and it's companion die. Thanks for stopping by today. I'll be back again tomorrow with more to share! Rounding out the newest Wplus9 Designers is Chupa Palamountain! "My name is Iwona Palamountain, I’m also known by my nickname Chupa. I’m a mum to two beautiful girls, a preschooler and a toddler. I’ve got a truly amazing husband who gives me all the understanding and support I need. I call Australia home, but I come from Poland where I spent a big part of my life. When I'm not running after my girls, I like to retreat to my craft room and stamp away! 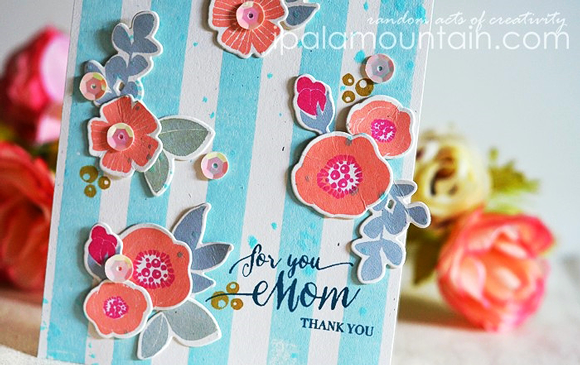 Card making is a passion that has been going strong for over four years. I'm excited to join the WPlus9 family and I hope to bring you inspiration." Chupa's personal blog: Random Acts of Creativity. 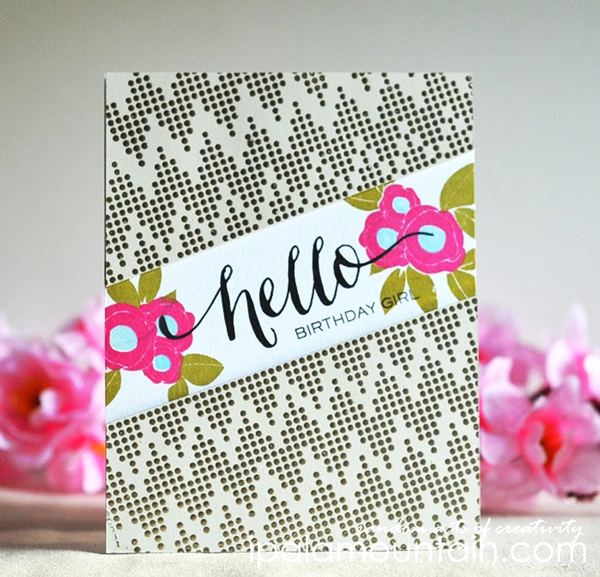 It's Chupa's turn this week to share her designs with us featuring our April 2014 Release. She has such a unique and creative style that I'm sure you are going to love. Here are just a couple that have really inspired me. Chupa has such a fantastic eye for layering! I'd say it flirts a bit with the eclectic side. Yet, it is still so incredibly feminine. This card is a perfect example of the many reasons that I love her work. She's used Spring Blooms and Strictly Sentiments 4 beautifully here. The colors are amazing, and the organic flow of the layout paired with the linear stripes really grabbed my attention. I think you all know why I love this. I'm such a sucker for this combination. 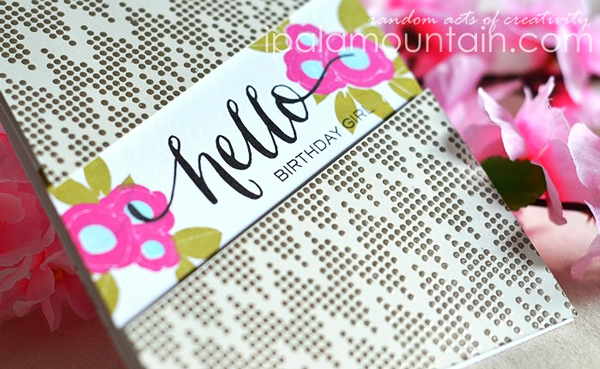 The large sentiment from Hand Lettered Hello not only holds it own, but stands out against the bold pattern from Borders & Backgrounds 4, while the little blooms add a punch of color and interest. And that silver embossing takes it to the next level. This is just a taste of what Chupa will be bringing this week. I hope that you will join me in welcoming her to Wplus9. I have been such a fan of her for quite some time and I am so excited to be working with her! 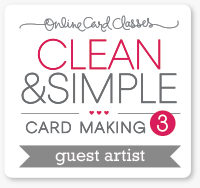 It's time to announce the lucky winner of FREE registration to Online Card Classes: Watercolor for Card Makers. Congratulations Denisse! Please email customer service@wplus9.com with your full name and email address so that I can send along your information. I wanted to pop in quickly today to let you all know about a fun blog hop that is happening today. 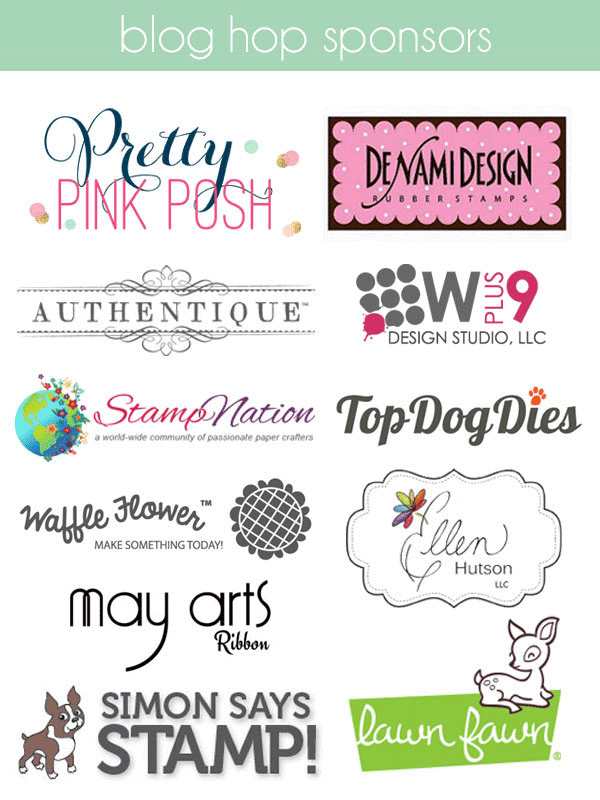 Just in case you didn't already know, Pretty Pink Posh is hosting their very first blog hop! And Wplus9 is proud to be one of the many wonderful sponsors! Here's all of the details you'll need to hop around. DATE: The blog hop starts TODAY, Saturday, April 26, 2014 at 6AM, PST and will run until Monday, April 28, 2014 at 11:55 PM, PST. WHO: We want EVERYONE to be involved. If you love sequins and have a blog, you are welcome to join along. Don’t have a blog yet? This is a great time to start one OR you can just hop along and be inspired! PRIZES: There will be ALL sorts of prizes…whether you’re entering creations into the hop, or hopping along and leaving comments on the stop, there will be prizes for BOTH! What kind of prizes will there be? There’s TONS of gift certificates and there are also prize packs! When I announce the winners, I’ll detail every prize from the sponsors, but let me just say that EVERY SINGLE prize is wonderful. 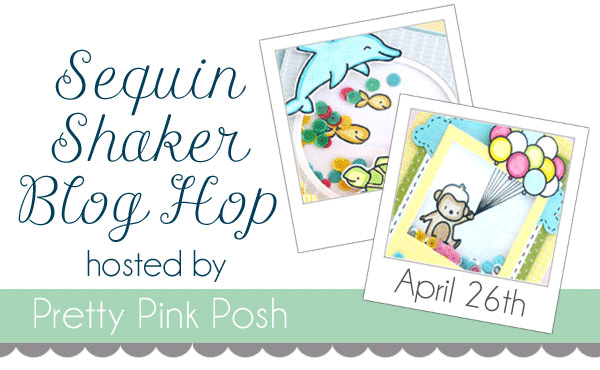 So if you plan on taking some crafty time today, be sure to join in on this fun hop. The wonderful prizes are just a bonus! The April/May release has been so much fun to create with! I'm not done yet, I still have two more projects to share with you today. 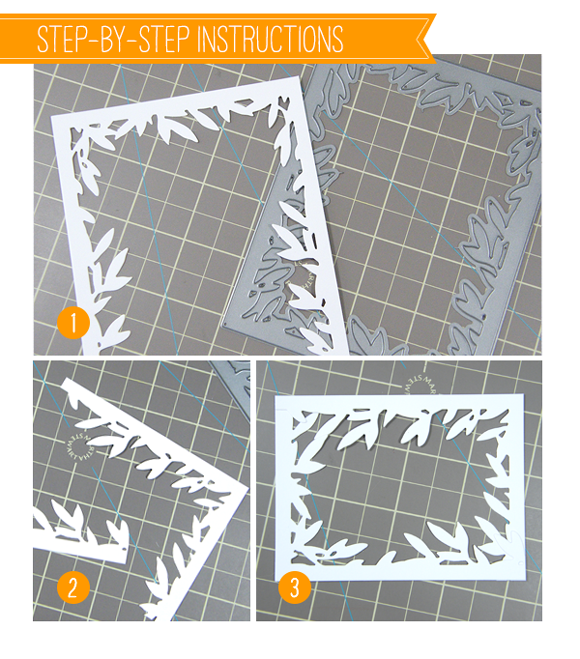 The Foliage Frame Die is another newly released product that has endless uses. I decided to keep this one classically clean and simple. Nautical Navy and Kraft are such a beautiful combination. This card could easily be mass produced and it's versatile enough that you can change out the sentiment and give this card to anyone, for any occasion. My last card is another one that I made using Distress Markers and watercolor paper. There are step-by-step instructions on here if you missed that earlier in the week. This stamp set and die are quickly becoming some of my favorites. The font is beautiful enough to stand alone on a card, like I've shown here. You don't always have to add a ton to a card. Sometimes simply stated cards, like the ones I've shown today, have the biggest impact! Thanks so much for joining me this week. I hope I've inspired you! I'm switching gears today and focusing on the clean and graphic style of design. 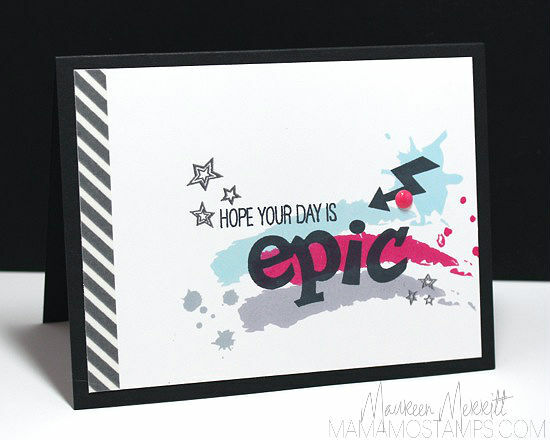 My first card features Epic Dad stamps and companion die, Ink Splats and Backgrounds & Borders 4. The bold patterns combined with the graphic nature of the sentiments in Epic Dad are perfect for clean and graphic cards. Monochromatic cards are a great choice for men. I started by stamping the card base with Backgrounds & Borders 4. 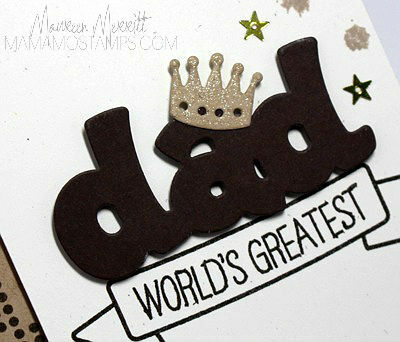 Then I got out my Oatmeal Cardstock and had some fun with the Epic Dad stamps and dies. I added a bit of shimmer to the crown using a Wink of Stella pen. I know guys don't like a ton of glitter, but you can't have a crown that doesn't shine! My next card is more appropriate for the tween/teen scene rather than Dad. This card was so much fun to make! I didn't really fuss over placement, I just stamped. Again, I played with some new-to-me color combinations from the PURE COLOR Original 10 Collection; Lake House, Sweet Gelato and Silver Lining paired with black. Though I liked the simple stamping, I thought it needed a bit more. Silver embossing, washi tape and an enamel dot finished off this card perfectly. I hope you are inspired to make some clean and graphic cards. See you tomorrow when I'm back to share more cards from the April/May release! Hello again! I'm back today with two cards featuring the newly released Spring Blooms Stamp Set, Spring Blooms Dies and Strictly Sentiments 4. This is actually the first card I made with the new products. Floral stamp sets are by far my favorite and I was immediately drawn to Spring Blooms. I love the mix of flowers and leaves included in the set, there seems to be endless possibilities on how the images can be combined. I tend to use a lot of the same color schemes, especially when it comes to flowers. My thinking isn't so outside the box, until today! I went with a more modern and trendy combination by combining Wild Mango, Sweet Nectar and Silver Lining. 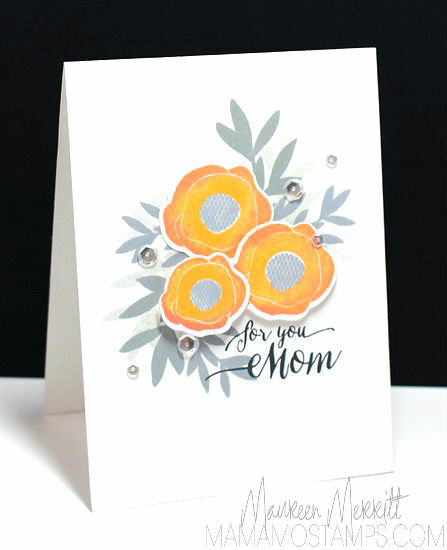 I die cut several blooms and inked each in Wild Mango ink, then rolled the edges in Sweet Nectar before stamping down. This technique is a nice way to add interest to an image. The leaves were stamped twice in Silver Lining ink without reinking. Next up is a more traditional color combo. Sweet Nectar is quickly becoming a favorite of mine. I've framed this beautiful sentiment from Strictly Sentiments 4 with blooms above and below. The placement of the images and sequins help draw your eye right to the sentiment. I found that my stamping was a bit high on the panel, so I stamped one of the border images from Borders & Backgrounds 4 to the bottom. This definitely helped to even out the design. Thanks for stopping by today. I'll have more to share with you tomorrow, so make sure to pop in again!! Hi, it's Maureen here sharing projects using products from the April/May release. 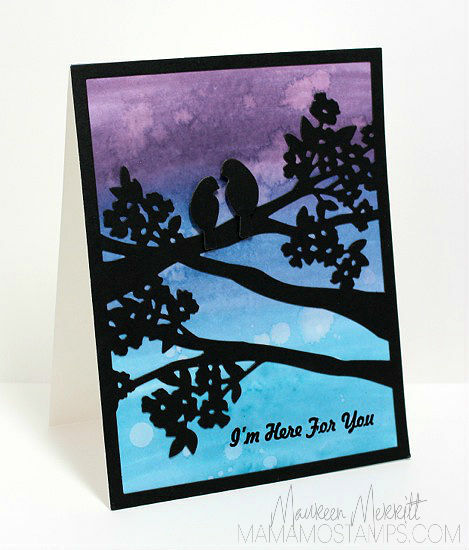 Today I am sharing two cards featuring the Birds & Branches Frame Die. Large Frame Dies like Birds & Branches allow you to really be creative. You can keep them simple or really dress them up. For my first card I wanted to focus on the negative space. Color with your next color, overlapping the colors a bit. Continue adding desired colors using the same method. 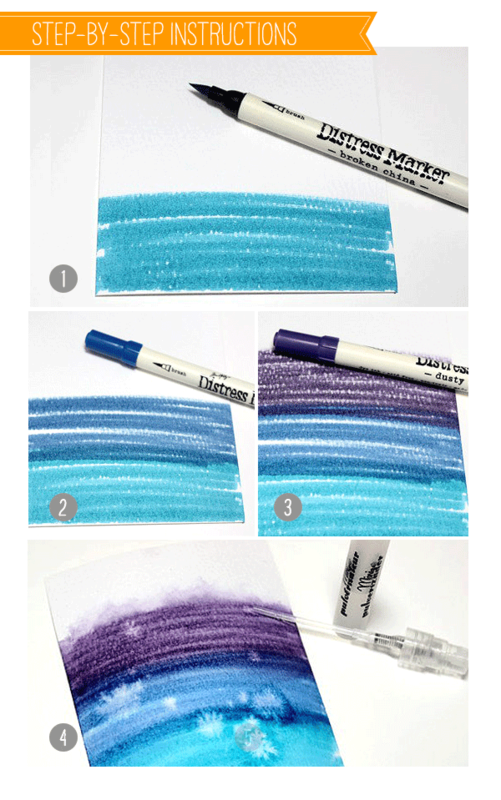 Mist the card stock with water. For more extreme water spots, try taking the top off of your mister and flicking water onto the paper. Allow to air dry, or use a heat tool to speed up drying. I'm a CAS girl, so I kept the rest of my card nice and clean. The Black Cardstock looks like a silhouette in a night sky. The stark contrast of the black against the color is just stunning. My next card uses a much softer palette. This time I let the beautiful details of the Birds & Branches Frame Die shine. I popped the frame up and placed vellum card stock in between the Birds & Branches Frame Die and the card base. This really softens the look. I added a tag from Timeless Tags 2 and stamped an image from Valentine Wishes. This little wreath was the perfect size for the bird to perch in. 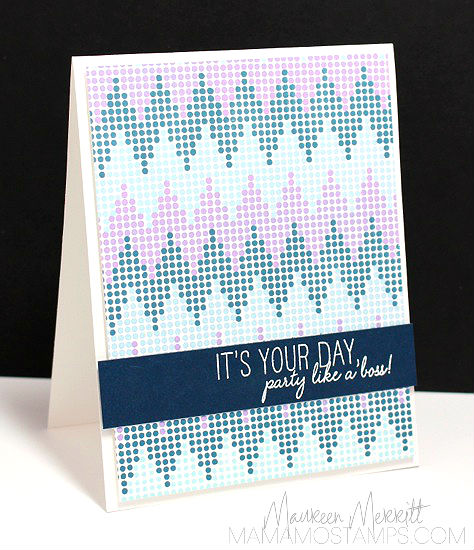 The sentiment, from Strictly Sentiments 4, was stamped in Sweet Gelato ink. 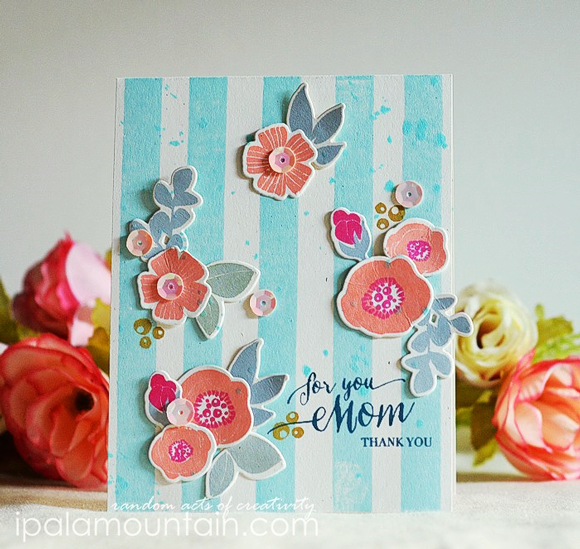 This card would be perfect for mom for Mother's Day or any other day of the year. I hope you like my projects today. I'll be back tomorrow with more. See you then! 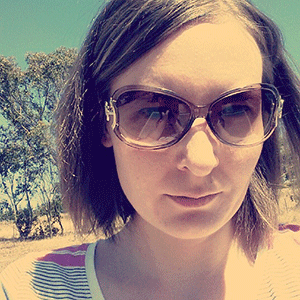 It's time to meet another of our new Wplus9 Designers. 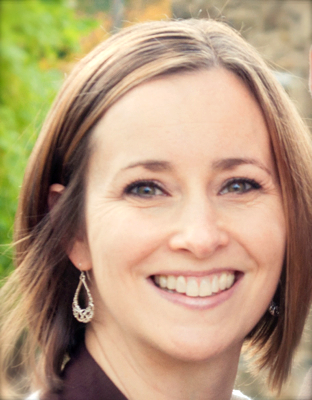 I'm excited to formally introduce Maureen Merritt! "Hi, I'm Maureen, a wife, mom and stamper living in Northeastern Pennsylvania. I have been paper crafting since 2003. My love of photography piqued an interest in scrapbooking, which ultimately led to stamping and card making. THAT is where I have found my passion. I am a minimalist, both in my real life and in my creative space, clean and simple is most definitely my style. Though you'll usually find me stamping, I also enjoy hiking, reading, Tae Kwon Do and photography. To say that I am excited to join the Wplus9 design team is an understatement, it's truly an honor and a dream come true!" 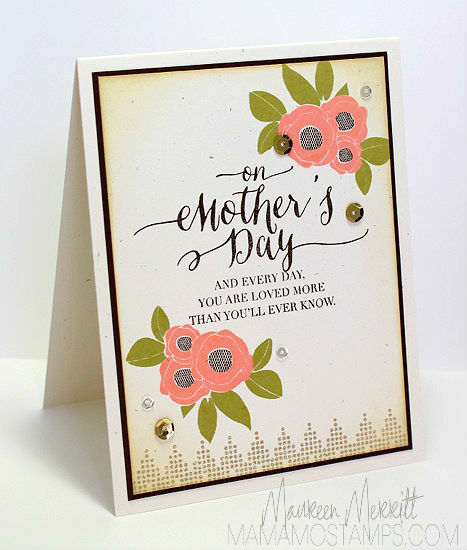 Maureen's personal blog: Mama Mo Stamps. Maureen will be here all week sharing her designs with us featuring our April 2014 Release. You will definitely leave each day inspired to create. Here's a couple that I picked from the lot. Maureen is spot on when she describes herself as a minimalist. I love her clean and simple style, and the fact that she isn't afraid to go outside of her comfort zone a little as well. But she always manages to rein it in and keep the overall design clean. No fuss, no muss. Just great use of color, pattern and design. First, I was pulled in by the color combination here. Using our PURECOLOR Dye Ink in Nautical Navy, Lake House and Bloomsberry, she's created this striking background using Borders & Backgrounds 4. Then her clever use of the Nautical Navy card stock to hold the sentiment. The nice dark color gives the eye somewhere to rest and brings order to the pattern. Maureen always seems to work the current trends into her designs in a way that stays true to her style as well. Not that "I" would ever call watercolor a trend. LOL I'm so happy to see it getting it's time in the spotlight within the crafting community. By constraining the use of watercolor to a straight graphic border and die cut, she's demonstrating a perfect example of adapting watercolor's free spirit into her more orderly style. And I particularly love how she's stamped the black outlined "hello" from Hand Lettered Hello behind the watercolored Hand Lettered Hello Die. I'm a big fan of stark black against soft watercolors. 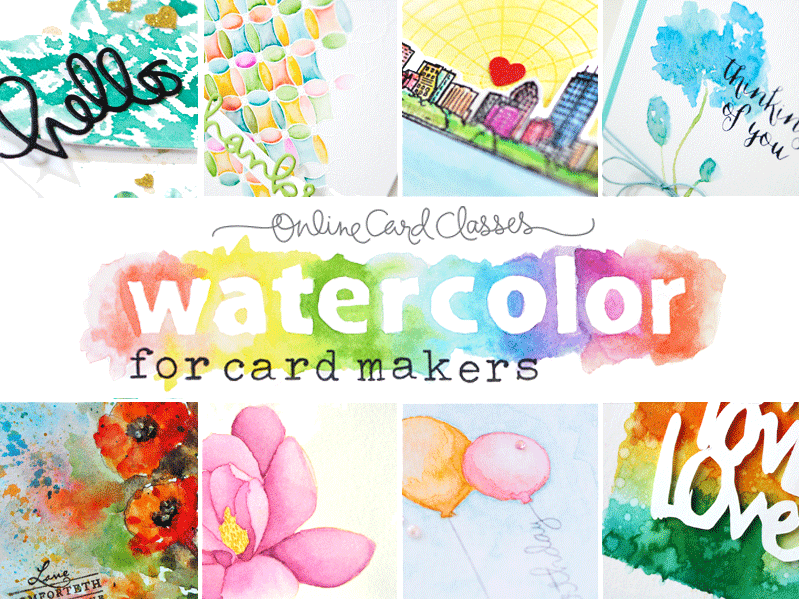 That's right, there is an upcoming Online Card Class featuring watercolor! I am so excited for this class! You don’t have to be an Impressionist painter to create watercolor masterpieces! Explore the many different (and easy!) ways to create beautiful watercolor effects in Online Card Classes’ Watercolor for Cardmakers. Join Kristina Werner, Jennifer McGuire, Jennifer Rsaza, and friends (including me!) for a fun-filled, all-video, two-week course packed with inspiring, approachable techniques. 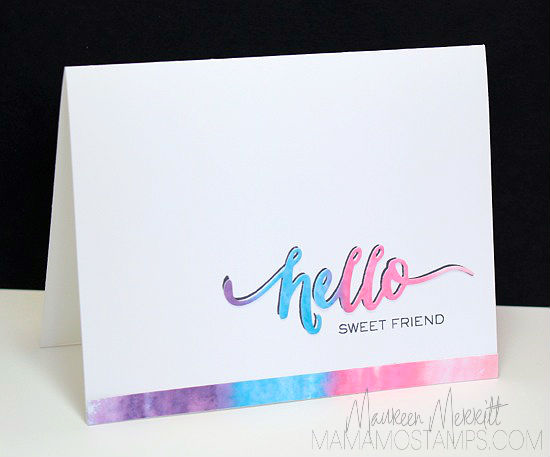 Starting with easy soft sky washes and progressing to darling hand-painted images, this class is tailor-made for the both the aspiring artist and the cardmaker who wants to add to her go-to collection of on-trend techniques. Sounds like fun, doesn't it? The generous ladies over at Online Card Classes are letting me give away free class registration to one of you! To enter, just leave a comment on this post by 11:59 PM EST Friday, April 25, 2014. I will post the winner on Saturday, April 26, 2014. And, don't forget, Maureen will be back each day for the rest of the week sharing more of her work and inspiration! Today is my final day to share what I have been up since receiving the Wplus9 April 2014 Release products. By now, many of you are starting to share what you have made with these beautiful new products. I have a seen a few and I look forward to seeing more! This is the first card I made when I received the new release. I couldn't wait to ink up those beautiful Spring Blooms and try out the PURE COLOR Dye Ink for the first time. If you've visited my blog recently, you know already that I love them and have been sharing some of my favorite color combinations. Sweet Nectar, Sweet Gelato, Cranberry Crush, and Appletini is one of them. I placed the blooms to mimic the flow of the Hand Lettered Hello sentiment, but also left a little spot of the right to stamp 'sweet friend'. I love having these any occasion cards on hand for when I start thinking of a particular far-away friend and want to drop her a note. Even though texting is faster I still send hand written notes and I know they are appreciated. Nothing but glitter on this next one. There are many ways to do this, but I will share with you what I did. I took a piece of white cardstock that was a little larger than the Birds &Branches Frame die and ran it through my Xyron. Without removing the protective film I placed the frame die face down onto the card stock; sticky side up. Then, I ran it though my die cutting machine. After popping out the negative portions of the die, I removed the protective sheet, sprinkled the entire frame with glitter, and voila! The negative pieces didn't go to waste. I used those to die cut the hearts using the Love Notes dies and the birds from the Birds & Branches Frame die. I popped up everything on a card base that had been sponged with Lake House Dye Ink. I'm really excited to share this final card with you. I used the Foliage Frame Die to create a custom frame for my Folk Art Alphabet monogram. And, it can be made to any size you like. Measure opposite corners to desired length and trim. To hide the seams, I embellished the corners with Spring Blooms stamps and dies. I've really enjoyed sharing my projects with you this week. I look forward to Monday when Dawn will introduce another new DT member and we will get to see what she has been working on!